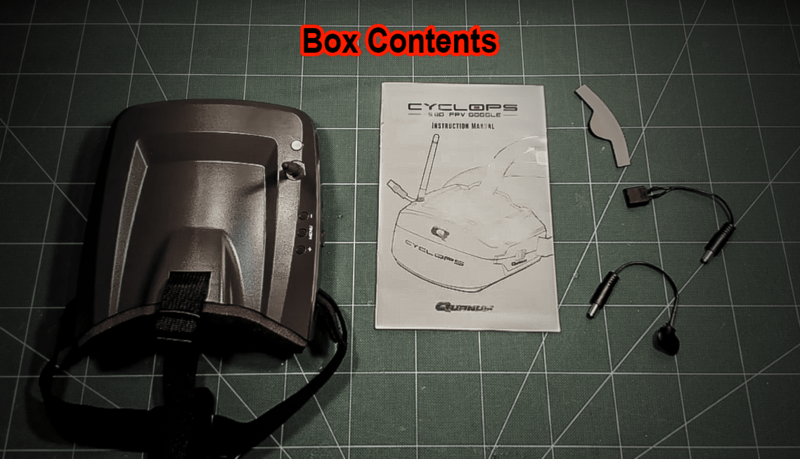 HobbyKing kindly sent us their Quanum Cyclops FPV Goggles to review and compare. Here is what we think. The first thing that I noticed is that these goggles are light. Really light. The Quanum V2 Pro goggles feel so much heavier in your hands than the Quanum Cyclops. They even feel more comfy than the V2 Pro too – they have an extra couple of cm of padding around the edge of the goggles. Whats even better is that this padding comes pre-glued meaning that you won’t have to do any DIY maintenance yourself. On the left and right hand side of the goggles there is a slider button that adjusts the focus of the screen. This is great since many cheaper goggles don’t include this feature meaning that you don’t always get a crisp shot when flying. 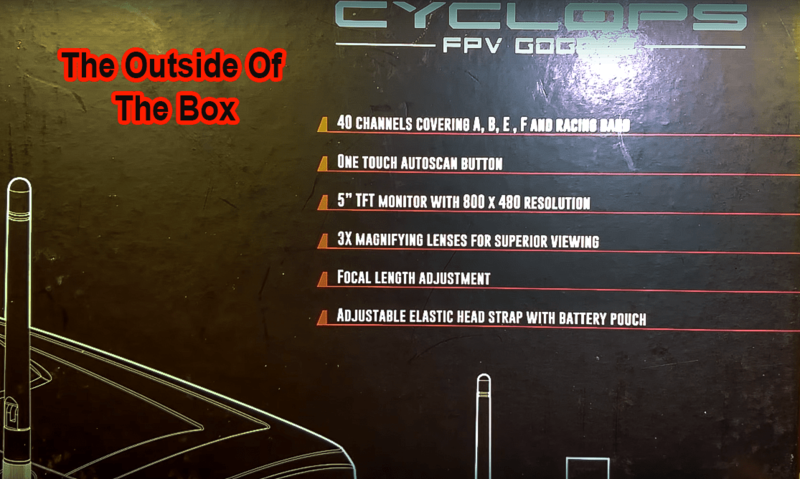 Finally there is an antenna and an auto-scan button that lets you look scan for channels. 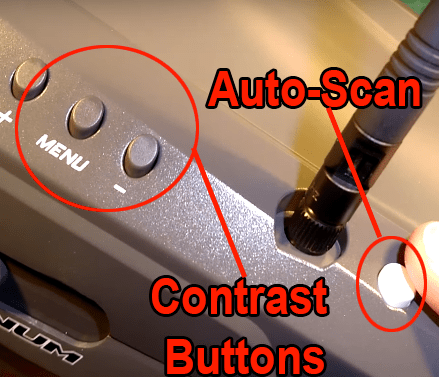 This is one of downsides of the goggles – you have to rely on the auto-scan button to find the right channel meaning you cannot adjust the channel manually. After putting all these googles side by side the first thing that I noticed was that the Cyclops was much more compact than the V2 goggles and was about the same size as the V2 pro goggles. However the main difference is when you come to the weight. The Cyclops (with the integrated receiver) weighs just over 400g which is pretty light weight. However, the V2 (with your desired receiver) will weigh around 500g whilst the V2 Pro (with your desired receiver) will weigh around 600g. Despite the fact that I have already said how I don’t like the auto-scan button. Every time I have used it, it has successfully found the correct channel. I found that the menu button along with the plus and minus button, were satisfying ‘clicky’ and the contrast/brightness on the screen was easy to adjust. 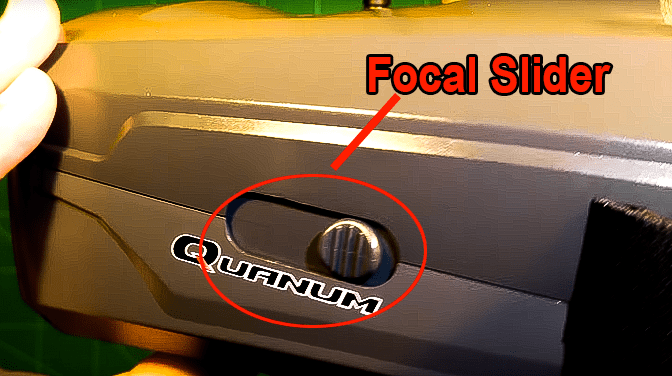 The image quality on the Quanum Cyclops is decent. I couldn’t really tell the difference between the V2 Pro and the Cyclops since the magnifications factor is virtually the same. If I was being really picky I would say that the V2 Pro had a slightly sharper image than the Cyclops (since it uses acrylic lenses) but the difference is minimal. However they are not as high quality as the V2 goggles and the auto-scan button could be unreliable in the future. Buy the Quanum Cyclops here.